This thread is simple! Rather than having a million little threads about everything that goes on at Walibi Holland, this thread is designed to consolidate it all into one user-friendly thread. Feel free to use it to post updates, trip reports, questions, comments, and of course, general discussion. For pictures and videos of the park as well as past updates, see TPR's Park Index Walibi Holland Page. October 16th, 2010 - The Music Battle coming in 2011? February 3rd, 2011 - La Via Volta update to include new Vekoma trains with on-board audio! February 6th, 2011 - Speed of Sound (La Via Volta) audio revealed! March 1st, 2011 - Speed of Sound tunnel and theming added! March 3rd, 2011 - Speed of Sound tunnel construction complete! March 14th, 2011 - Speed of Sound trains added to the track! March 17th, 2011 - Speed of Sound entrance complete! March 25th, 2011 - Speed of Sound testing video posted! April 6th, 2011 - Speed of Sound on-ride POV posted! I got this press release from Walibi World, and it's all in dutch, so all I can make out of it is what I get roughly translated from Babelfish and the screen shot they sent me. I'll post both versions of it here, the original in Dutch and the translated version and see if YOU can make heads or tails of it! 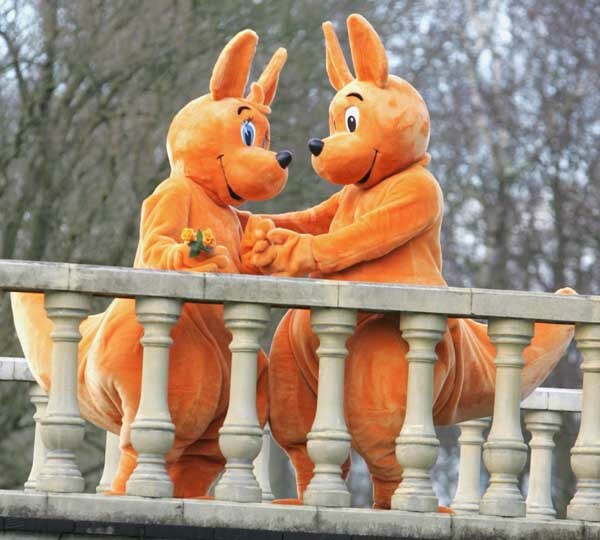 Walibi, the new hero of Walibi World (former Six Flags the Netherlands) are with its girlfriend Walibelle! Last week Walibelle did a succeeded help recall to the Netherlands its with finding the way to Walibi. As a thanks for all aid, they will bring together special Valentijnsverrassing to Monday in the surroundings. WALIBI EN WALIBELLE TOCH SAMEN MET VALENTIJN! - Biddinghuizen, 14 februari 2005 - Walibi, de nieuwe held van Walibi World (voormalig Six Flags Holland) is weer samen met zijn vriendin Walibelle! Vorige week deed Walibelle een geslaagde oproep aan Nederland om haar te helpen met het vinden van de weg naar Walibi. Als dank voor alle hulp, zullen ze maandag samen een speciale Valentijnsverrassing brengen in de omgeving. Here's the photo that they sent. It LOOKS to me like two of the costumed characters got either engaged or married...or SOMETHING!!! :shock: All I know is that I'm kind of creeped out by it, and I can't quite figure it out! Who can come up with the best caption for this photo? Last edited by larrygator on Tue Feb 06, 2018 10:02 pm. Last edited by kenshinmac on Wed Feb 16, 2005 3:07 pm. Closer to Goliath than Elissa! Aaaaah, Walibi and Walibelle... aren't they cute?? Walibi was from 1995 - 2000 in the park, and is back from travelling around the world. Dude, I seriously cannot get over that picture! It kind of looks like one of those "furries" conventions! Seriously I don't know if this is worse or not because they will be around kids. I didn't actually go to one!!! But I saw it on CSI! Yes Yes...ppl from the netherlands are mad. LoL this is like promotion stunt number 30000. And i think there are a lot more to come. The promotion that was done before this one, was that the Walibi got some kind of dutch pasport at the mayors office, and it's now a official member of holland....there were balloons and everything! I'm really looking forward to going back to this park. Has it changed much since it returned to the Walibi name?